U.S. agriculture has several lingering questions heading into 2016 and the strong U.S. dollar is one of them. 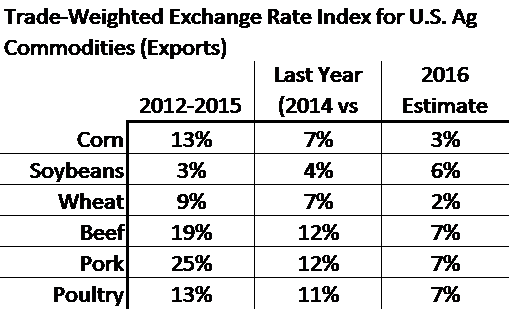 Nearly a year ago we first wrote about why exchange rates are important and highlighted how challenging they can be, especially for grain exports. In this post we take a look at current exchange rate conditions, commodity-specific impacts, and what might be in store for the U.S. dollar and agriculture in 2016. Since 2011 the U.S. Dollar has trended higher (Figure 1). Significant strength was observed in the fall of 2014 and the Dollar continued higher through 2015. On January 1, 2015 the trade-weighted U.S. Dollar Index was at 87.5 and finished the year 9% higher (or at 95.3 on January, 1 2016). While the Dollar has certainly appreciated in recent years, it has not anywhere near the historical highs of 1985 (143) or 2002 (112). In fact, the Dollar is currently at levels frequently observed during the late 1980s and early to mid 1990s. Figure 1. 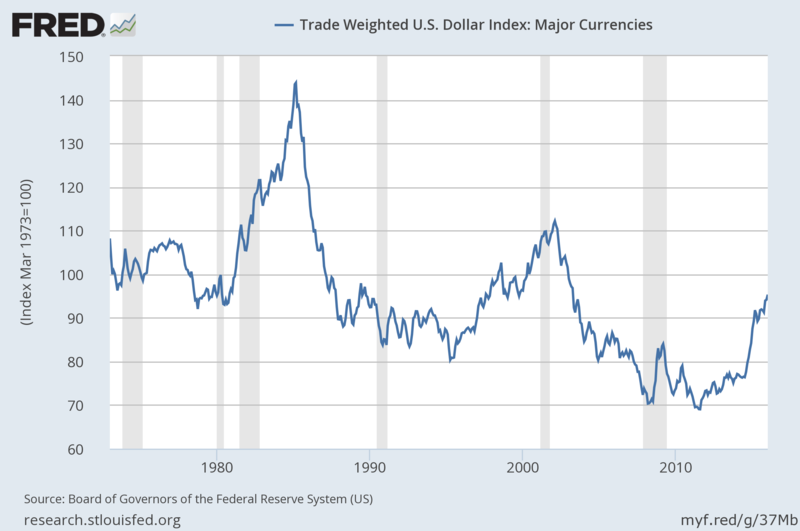 Trade Weighted U.S Dollar Index. Chart from the Federal Reserve Economic Data, Federal Reserve Bank of St. Louis. Often conversations about the “stronger Dollar” are at a high-level. Data, like figure 1, are reflective of the total U.S. economy. Across industries and within the sectors of an industry the magnitude of a “stronger Dollar” can vary. Changes in exchange rates within agriculture will impacts each commodity different as, for an example, the export markets for corn are different than soybeans. In Table 1, changes in the USDA’s Index of Trade-Weighted Exchange Rate for select commodities are shown. The first observation is how different the increases have been across the commodities. From 2012 to 2015, the index has increased as little as 3% in soybeans to as much as 25% for pork. Overall, the impact have been most significant on beef, pork, and poultry with each more than a 10% increase in the index values. A second observation is that indices values were up substantially in 2015. Corn was up 7% for the year with beef, pork, and poultry up 11-12% each. These were big adjustments for just one year. Finally, the USDA also provides commodity-specific estimates for 2016. Comparing estimated 2016 levels to those observed in 2015, additional exchange rate strengthening is expected. The soybean exchange rate index, which has observed fairly small changes through 2015, is set for a 6% increase in 2016. Corn and wheat are expected to increase 3% and 2%, respectively. Also, livestock exports are again set to face the strong increases in the exchange rates. Overall, however, the estimated increases for 2016 are mostly lower than what was observed in 2015 (soybeans being the exception). Table 1. 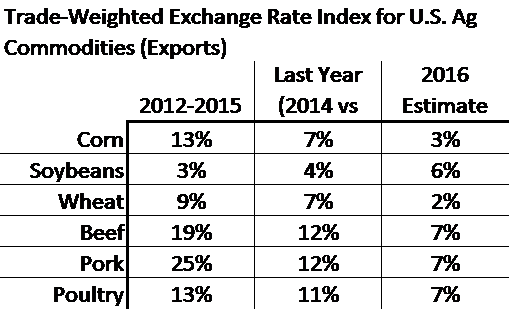 Changes in the USDA ERS Estimated Trade-Weighted Exchange Rate Index for U.S. Agricultural Commodities (Exports). In recent months much attention has surfaced about how exchange rates have positioned Brazilian farmers in favorable conditions. 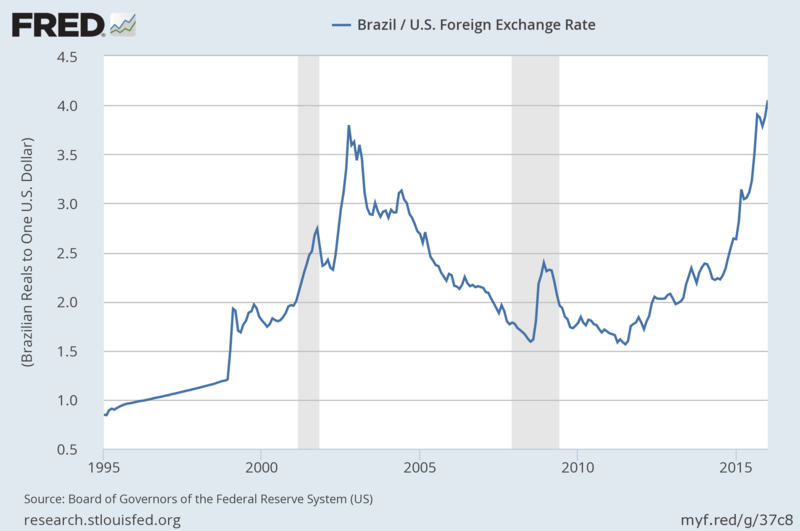 In figure 3, the exchange rate between the Brazilian Real and U.S. Dollar is shown. Currently, the exchange rates is 4 Reals to 1 U.S. Dollar, nearly doubling since June 2012. Furthermore, the exchange rate are at the highest observed rate in the data series, since 1995. Figure 2. Brazilian Reals to One U.S. Dollar. Chart from the Federal Reserve Economic Data, Federal Reserve Bank of St. Louis. The impacts of the relationship between the Brazilian Real to the U.S. Dollar is difficult to capture. 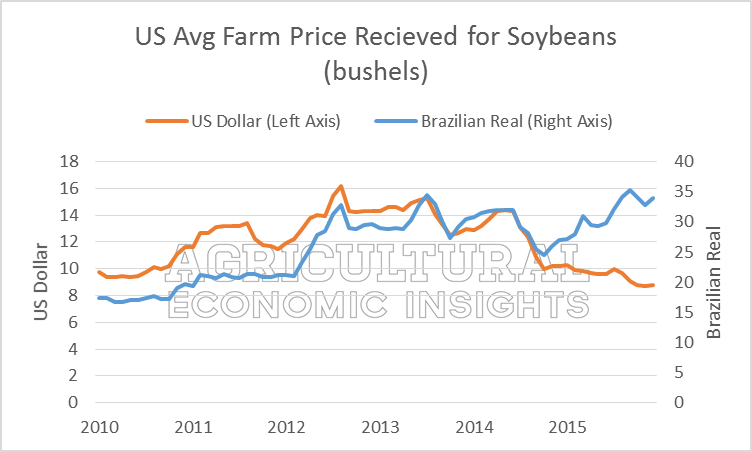 A simple but imperfect way observing the relationship is by adjusting the average price that US farmer receive for their soybeans ($ per bushel) to Brazilian Reals (Reals per bushel). This is shown in Figure 3. In orange (left axis) are soybean prices in U.S. Dollars while the prices in Reals are in blue (right axis). In U.S. Dollars, soybean peaked in late in 2012 on the heels of a widespread drought. Since 2012 prices have trended lower and are currently at the lowest levels observed since 2010. When prices are adjusted to Brazilian Reals, the uptick in prices corresponding with the 2012 drought is observed but the subsequent trend lower is absent. Since 2012 soybean price adjusted to Brazilian Reals have stayed strong and even continued higher. Currently, soybean prices in Brazilian Reals are higher than even price observed in 2012. Again, this example is not perfect but the implications are important. Even as the soybean prices that U.S. farmers have received for their soybeans have fallen in recent years, the price of soybeans in Brazilian Reals has significantly increased. Before jumping to conclusion about how preferred condition in Brazil might be, it’s worth nothing that exchange rates are all about relative economic conditions and the weak exchange rate in Brazil is a reflection of troubling macro-economics, including double-digit inflation and slow economic activity. Figure 3. U.S. Average Farm Prices Received for Soybeans in US Dollar and Brazilian Reals (2010 to 2015). Data Source: USDA NASS and FRED (Federal Reserve Bank of St. Louis). Commodity-specific impacts of the overall stronger U.S. Dollar has varied (Table 1). The largest increases in the commodity exchange rate indices occurred with livestock products. While additional increases in the commodity indices are estimated by the USDA for 2016, the rate of increase is mostly less than what was observed in 2015. When comparing conditions in the U.S. to those in Brazil, U.S. producer are facing the lowest local price (U.S. Dollars) since 2010 while the Brazilian price equivalent is at record-high levels. Finally, it is also important to keep in mind exchange rates are a two-way street as they also impact imports. In an earlier post we noted the increase in U.S. beef imports. Strong exchange can also be beneficial for purchasing imported agricultural inputs, such as fertilizer.